I disagree with almost everything Mr. Reed suggests in his post. For a year or so I commuted through that tunnel almost every day. It is an excellent amenity. Mr. Reed suggests that the on-street alternative may be safer because of the likelihood of crime, and he points out crime problems at other bike/ped facilities. This is a red herring argument. The tunnel has been open since 1998 and crime has not been an issue. Undoubtedly it will be even less so with greater usage. The safety benefit of not having to cross Wisconsin Avenue at grade is much greater than any potential danger associated with crime. He argues that bikes should be on the streets, because then all users will see them as "belonging" there. I agree with this idea, but it makes no sense when there is already an excellent grade-separated facility in existence. I suspect that way over 95% of all bike traffic in the region is already on the streets, so eliminating this one tunnel will not make any difference. Eliminating one of the very best grade crossings in the entire region does nothing to improve cycling; it degrades it. Also, the existence of the much better future Capital Crescent Trail itself will likely increase the number of cyclists in the Bethesda area, so this goal is achieved anyway. Back in the 90's cyclists fought long and hard to get the tunnel opened because it was a terrific alternative to the on-street routes. It was an enormous success and trumpeted in the biking community when it happened (I remember, in fact). Were we all wrong about it then? Would cyclists have been better off these last 13 years riding on the streets? Or turning the argument in a different direction, would it be better to eliminate the Custis Trail through Arlington in order to put more bikes on the streets? Or the W&OD through Falls Church? Creating cycling facilities like those found in Copenhagen or Amsterdam--including grade-separated facilities like the one shown here--makes it better for cyclists, and more cyclists are everywhere, creating a better atmosphere all around. Those cities did not achieve their high biking mode share by eliminating grade-separated crossings. Boulder, CO has added 20 new grade-separated crossings in the last 20 years, and cycling has gone up, not down. And there are lots more cyclists on the streets, too--not just the trails. Minneapolis's new Greenway is celebrated as a fantastic success for cyclists and pedestrians. Those are all examples of adding to the bicycling infrastructure, not subtracting from it. And in all cases, street cycling has increased as well. The alternative on-street route could certainly be designed well. Even at that, though, it is not as good. The shortest alternative adds about 400-500 feet to the trip (the longest one about 1500 feet), but it also entails a 30-foot elevation rise and fall and a major road crossing that will require a wait for a signal. This route is likely to add at least 1 minute to any cycling trip, costing as much 10,000 hours per year cumulative for cyclists and peds (at current usage rates, before increased traffic when the trail is completed to Silver Spring). In addition, auto traffic will also be delayed by longer signal cycles to accommodate trail traffic (which some might argue is good, but it's time lost, nonetheless). Should MontCo propose closing lanes and parts of streets and eliminating parking in order to create this route, they are likely to get pushback in the public process from drivers and businesses. Compromises in the design are not unlikely. There's no guarantee that the alternative on-street route will end up being as wonderful as Mr. Reed or Matt Johnson suggest. It could very well end up a lose-lose for cyclists and pedestrians: the tunnel option is eliminated and then the on-street alternative is compromised down to adequate instead of excellent. This trail is already busier than the Custis Trail through Rosslyn, so building a grade crossing at Wisconsin may end up creating as big a problem as the Custis Trail/Lee Highway crossing that is a huge headache for planners there and a significant hazard to users (admittedly, this on-street route does not suffer from the same design issues as the Arlington one and can be made safer). Should the cyclists and pedestrians lose this battle, it will once again send the signal that they are are lower priority citizens. Cyclists showed up in droves a couple of years ago to keep the tunnel open during the upcoming development by JBG and, with the help of Commissioner Berliner, were able to get that concession from the developer. Obviously the cyclists would rather have the tunnel than the street. Mr. Reed suggests that taking the trail out of the tunnel will somehow make this a "better experience." Thanks, but I can decide for myself if I want to go to a shop or not, and so can other cyclists and pedestrians. When I was commuting from Arlington to Silver Spring, I wanted to get home--not browse some shop windows, thank you. And I couldn't wait for the tunnel during the dark winter nights, and it made for great shelter during summer thunderstorms. But other times when I was actually visiting somewhere in Bethesda, I could *gasp! * not go through the tunnel and proceed directly to my destination on the streets. As mentioned previously, cyclists fought to get the tunnel opened originally and fought to keep it open during potential building construction. If they thought they would have a "better experience" on the street, then why did they fight so hard? And nothing is precluding Montgomery County from building excellent on-street bike amenities, too. In fact, they should: the existence of the trail will complement good on-street facilities and vice versa. 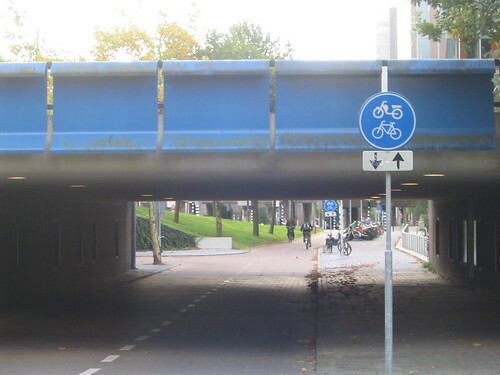 They go hand in hand, just as pointed out above in good-cycling European cities. Once it's done, it's done forever; they will never put the trail in the tunnel if they don't do it at the same time as the trolley. Fifty years from now no one will care how much it cost way back then, but they will be really happy it's there. Does anyone remember how much it cost the B&O to build that tunnel 100 years ago? No. But boy are we happy it's there now. Keeping this excellent piece of the regional bike infrastructure is critical to the ongoing growth of cycling and continuing to improve Washington's standing as a good biking area. As Dan mentions in his post, the trail has been included in plans for the Purple Line for more than 20 years, including the tunnel portion. It's a promise that should be honored. It should not be eliminated to save a few dollars that no one will remember a decade from now. Happy to hear someone speak about this issue intelligently. I would hope, Steve, that you send this opinion to the Montgomery County Council who will be deciding on the issue in January.